Globally, nutrient loading to surface waters is large and increasing, with sources from land-based pollution to aquaculture and atmospheric deposition. Spatial differences in amounts and forms of nutrients released to receiving waters are large, with Asia, Western Europe, and North America exporting the highest loads of nutrients, especially of inorganic nitrogen (N). Export of N is increasing more rapidly than that of phosphorus (P) on a global basis, leading to stoichiometrically imbalanced nutrient conditions. Under such conditions, some types of harmful algal blooms (HABs) can thrive. Differences in coastal typology affect the retentive nature of different coastal types, while dam and reservoir constructions have further altered riverine flows and differentially retain different nutrients. A coastal eutrophication index comparing information on the changes in N and P relative to silicon (Si) and modeling projections of future outcomes using several modeling approaches show that the likelihood for increased nutrient pollution and, correspondingly, for continued regional and global expansion of HABs is great. 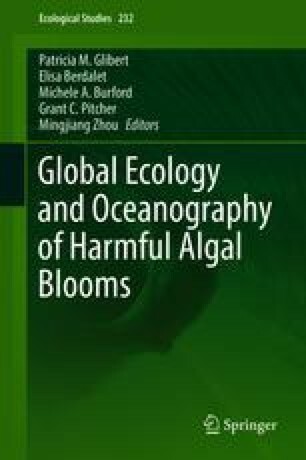 This effort is a contribution of SCOR Working Group 132 on Land-Based Nutrient Pollution and Harmful Algal Blooms and is also contribution number 5404 from the University of Maryland Center for Environmental Science. This work received support from the Global Environment Fund, UNEP, and UNESCO-IOC funding to A. Bouwman, A. Beusen, and J. Harrison, as well as USDA Water Sustainability and Climate, USDA Earth Systems Modeling, and NSF INFEWS funding to Harrison. Laruelle is Chargé de recherches du F.R.S.-FNRS at the Université Libre de Bruxelles. Dürr received funding from the Canada Excellence Research Chair in Ecohydrology.